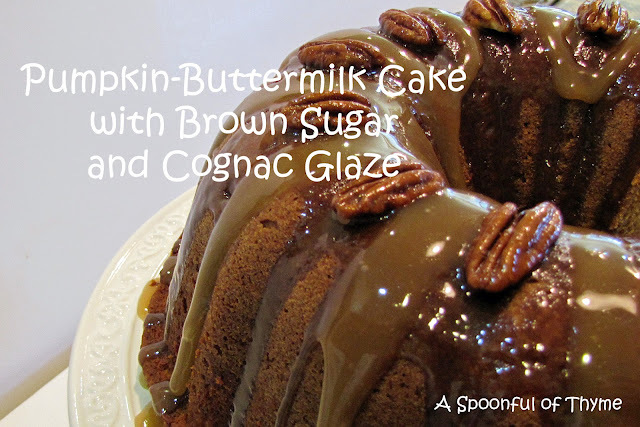 Oh the goodness....pumpkin, pecans, brown sugar glaze with just a hint of cognac...oh my. I always think that if I start baking we will be blessed with fall weather. I have been waiting for it to cool down and while I wait I am enjoying another slice of this wonderful cake. 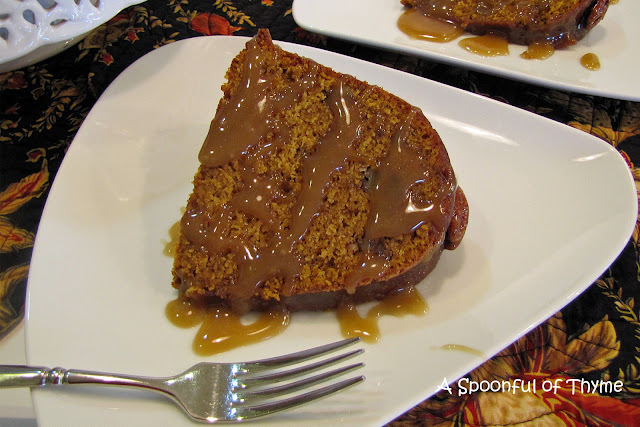 It is so moist and as promised in the recipe, the flavors do seem to deepen on the next day. This is a super keeper!! I am thinking it would be the perfect dessert at Thanksgiving. I saw the recipe in the most recent issue of Fine Cooking magazine under the heading Bake Now, Eat Later....there was no later at our house. What were they thinking? Before I could bat an eyelash, Chris at The Cafe Sucre Farine had adapted the recipe just a bit and posted her beautiful cake. Heat the oven to 350°F. Generously butter and flour a 10- to 12-cup tube pan. In a medium bowl, sift together the flour, baking powder, ginger, cinnamon, salt, baking soda, nutmeg, and cloves. In a measuring cup, combine the buttermilk, cognac, and vanilla. In a stand mixer fitted with the paddle attachment, beat the butter on medium speed until creamy. Gradually add the oil, beating until combined. Add the brown sugar. Increase the mixer speed to high and beat, scraping down the sides of the bowl as needed, until light and fluffy, about 4 minutes. Add the eggs one at a time, beating well on medium-high speed after each addition. Beat in the pumpkin. Reduce the speed to low and slowly pour in the buttermilk mixture, and mix until combined. Gradually add the dry ingredients to the batter, mixing just until combined. Fold the toasted, chopped pecans into the batter. Scrape the batter into the prepared pan, smooth the top, and tap the pan on the counter once or twice to settle the batter. Bake until a wooden skewer inserted into the center of the cake comes out with just a few moist crumbs clinging to it, 50 to 60 minutes. Cool the cake in the pan on a rack for 10 to 15 minutes then invert the cake onto a rack, removing the pan, and cool completely, at least 3 hours. Heat the brown sugar, honey, and 1 Tablespoon water in a quart saucepan over medium heat, stirring until the sugar is dissolved. Add the pecans and stir until coated. Spread the pecans curved side up on an oiled baking sheet and bake at 350° F. until fragrant and shiny, 7 to 10 minutes. Transfer the pecans with a metal spatula to parchment to crisp and cool completely, about 20 minutes. In a medium saucepan, combine the brown sugar, butter, corn syrup, cognac, and salt, over medium-high heat until the butter melts and the sugar dissolves, about 2 minutes. Add the cream, raise the heat to high, and bring to a boil, watching and stirring constantly. Continue to boil, stirring occasionally, for exactly 1 minute. Decorate with the candied pecans while the glaze is warm. I just happened to have a bit of the glaze remaining...so, I added just a touch when the cake was served...I really could eat the glaze by the spoonful...it is that good!! I am sharing at Foodie Friday hosted by Michael at Rattlebridge Farm, Sweet Tooth Friday, Foodie Friday hosted by Diane at Simple Living and Sweets for a Saturday. From Fine Cooking this recipe has to be tested, tried and true. OMG! I seriously considered licking my screen! Very nicely done! C'est beau! It's certainly that time of yr here.. This cake looks amazing and the glaze is to die for... please share this on my foodie friday party today. That looks so yummy! I love the double dose of alcohol and the use of oil instead of butter. This would make a great centerpiece for any dinner party! Now I came to look at your Balsamic Veggies, as I was thinking they might be a good idea to make. And look what I find but this tempting beautiful cake. Oh dear, now what must I do. Bring on the pumpkin! This cake looks amazing, it's pinned. Ummnn,, This cake makes me hungry. You have share all the instructions that we need to decorate this lovely party cake. 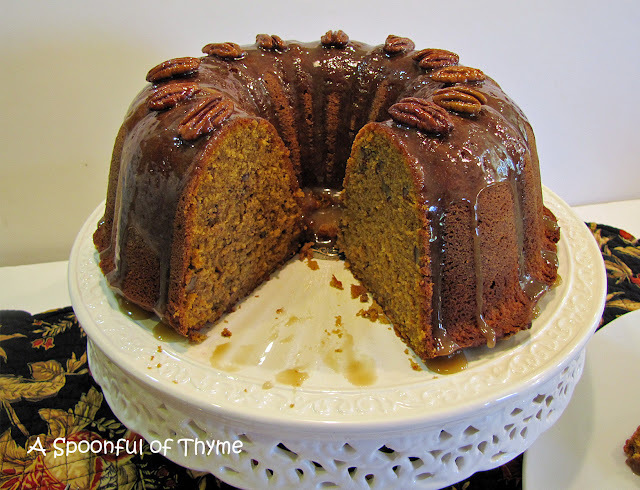 I once had a moist pumpkin cake recipe, that I loved, and I lost it. I think this might be very close to it. Bundts are fun to make (a lot less fussy work), so I'm saving this one. Beautiful, Cathy! This is what fall is all about! How positively scrumptious! Congrats, your wonderful cake is being featured today on foodie friday. Please stop by and get your featured button. 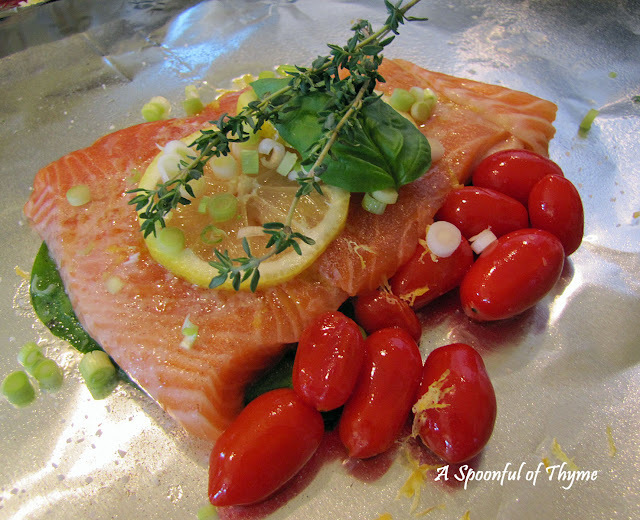 Thanks again for sharing such a great recipe.